The Los Angeles Rams have a young quarterback still on his rookie deal for the next three seasons assuming they pick up Jared Goff‘s fifth-year option, and they are taking advantage of the luxury of not having a large quarterback contract on the books with the most aggressive offseason in the NFL to date. They have made moves both up front and in the defensive backfield, and added playmakers on offense. So what do the Rams moves mean for their outlook in 2018? On the surface, trading a first-round draft pick for Brandin Cooks when the Rams already have Cooper Kupp and Robert Woods on their roster might seem like a luxury, but when you look at the Rams personnel usage in 2017, another top receiver was a team need. The Rams used three or four wide receiver sets on 86 percent of their offensive snaps last season, way up on the NFL average of 59 percent. While neither of the trio have shown themselves to be clear No. 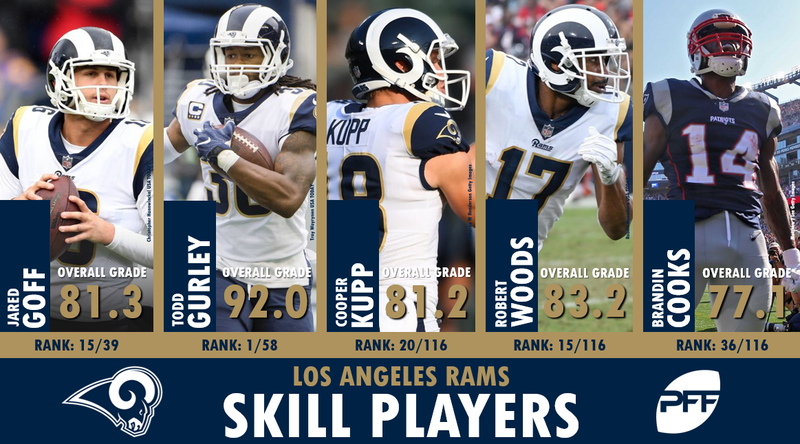 1 WR so far in their career, Woods, Kupp and Cooks produced PFF grades of 83.2, 81.2 and 77.1 in 2017, respectively. It also gives them three of the 25 most productive receivers in the NFL from last season, with Cooks averaging 1.78 yards per route run, Kupp 2.05 and Woods ranking eighth in the NFL averaging 2.17. So far in his career, Cooks has been primarily an outside wide receiver and both Woods and Kupp saw time in the slot last season, giving them versatility there. As we covered after the signing, the Rams’ signing of Ndamukong Suh made a huge statement of their intentions this season, and rumors that he wouldn’t be a scheme fit were quickly dispelled, with Suh seeing plenty of time at 1-tech and 2-tech in 2017, where he would fit to allow Aaron Donald to remain predominantly at 3-tech and continue to wreak havoc on the NFL. The duo should strike fear into every offense on their schedule in 2018, combining for 17 sacks, 21 hits and 96 hurries a season ago. The level of disruption they can bring to the interior is something we really haven’t seen in recent memory, so it will be interesting to see how teams attempt to deal with the duo. By alignment, it will be easier to double team Suh at 1/2-tech, but Donald’s level of play has been so transcendent that he requires extra attention too. With dominant pressure on the interior, plays will be there to be made from the Rams defensive backs with quarterbacks forced into early throws and likely several mistakes. With that in mind, the addition of Marcus Peters this offseason was huge. Peters is not without his flaws and has allowed 2,240 yards in coverage over the past three seasons, though that has dropped from 1,057 to 687 to 496 over his three-year career, but he is one of the top playmakers on defense in the entire NFL. 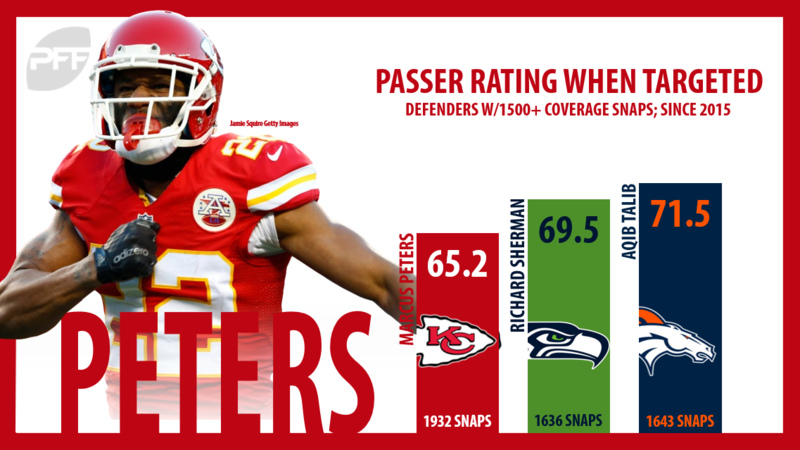 Since arriving in the league as the 18th overall selection in the 2015 NFL Draft, Peters has racked up 21 interceptions and 34 pass breakups and his NFL passer rating allowed of 65.2 on throws into his coverage is the lowest among all cornerbacks with 1,500 or more snaps in coverage since 2015. Third-lowest on that list is the other cornerback the Rams dealt for this offseason – Aqib Talib – who has allowed an NFL passer rating of 71.5 on throws into his coverage in that span. Talib has been one of the stingiest cornerbacks in coverage over the past two seasons, allowing just 601 yards in coverage since the beginning of the 2016 season. As much as the duo of Donald and Suh can wreak havoc on the interior of their defense, the Rams could benefit from improving on the edge as Matt Longacre (73.8) and Samson Ebukam (70.0) both graded outside the top-60 players at the position in 2017. They could also do with strengthening the linebacker position with Mark Barron sitting as their highest graded player at the position despite ranking just 44th with a PFF grade of 71.2 in 2017. All things considered, this is a Rams team which has planted a flag and made it clear that they expect to contend for the Super Bowl in 2018. They don’t have a shrinking window because of an aging quarterback, but their aggression highlights that the brass in Los Angeles understands that the window to be aggression in roster additions closes as soon as they have to spend big at quarterback, so it is well worth the risk to take the swings they have taken this offseason.